We visited Suan Lum Night Bazaar in Bangkok for some food and shopping. 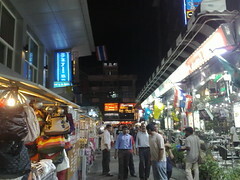 Shopping at night here is more pleasant than shopping at Chatchuchak Weekend market, cooler and less chaos. The wife and I made our way to Platinum to do a little shopping after lunch. 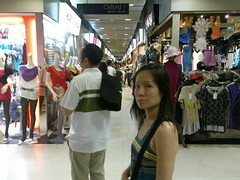 The place reminds me of the Korean wholesale malls, except Platinum isn't open 24 hours. We took the Skytrain from our Asok station to Chit Lom station and walked from there. Men, I recommend good walking shoes and a little training beforehand, if you want to have the stamina to follow the missus on a Platinum bargain hunting session. The aisles are narrow and the crowds are thick. And the missus will want to cover every nook and cranny of the place to ensure she misses nothing. We just reached the second floor after what felt like an eternity on the first. There are five floors of shops. So three more to go. I will so need a foot massage later. 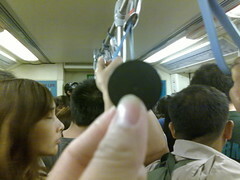 The question in my mind is, how come the Thailand MRT can use such a simple plastic coin for its contactless ticket and we have to use the expensive ez-link card that requires a deposit? My wife has arrived and we are staying at the Sheraton Grand Sukhumvit, courtesy of Wotif.com. I have to say, the room is huge. And I love the location next to the BTS Skytrain station (Asok Station) and the Subway. And this is my first real internet connection since I got to Bangkok. My life is complete. I will post some photos later but I have to pop out with the wife to have dinner now. Later! 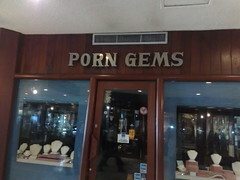 I don't think they sell what you think they sell. Bangkok Day 1: Little Arab Street of Bangkok? I cycled into this Soi (Adrianna tells me it's Sukhumvit Soi 3) with Iraqi restaurants and other Middle East fare. It was quite an experience. There were just a tad too many vendors selling toy glasses with blue blinky lights on them. 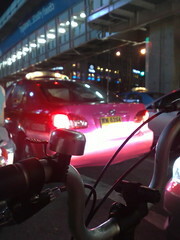 I spent the evening riding the streets of Bangkok on my Flamingo folding bike. The traffic can get a tad mad along Rama 1 Road. I made my way from Soi 11 where I am staying to Soi 19, for some street food. Dinner was a beehoon soup with beef balls, pork balls and fish balls. Then I rode towards Siam Square, stopping at a Watson's for some toiletries I forgot to bring. Above me, the MRT track ran. Even with the mass rapid transit, the traffic was crawling. I am planning to give the subway a try before I leave. It looks quite spiffy. Siam Square is bustling even at this late hour. I was looking for a (clean) massage place that used to be here but it was gone. Since I needed a haircut, I folded up the bike and popped into a busy salon for a wash-and-cut. Hope they don't give me too hip a look. Uncle not young liao. This photo was sent to me by my friend Faith T. There seems to be flooding at the Punggol exit. Poor brown car was stuck in the middle of the flood. All the cars had to go by the right most lane to avoid getting stranded like it. On my way to Bangkok for an ASEAN Media conference. 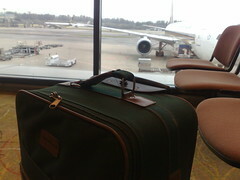 The Flamingo folding bicycle is checked in, and I have all my audio video gear with me, and the Macbook. I will be blogging, sending video back (live and HD) and twittering (follow me @mrbrown), so stay tuned here. I met some friends at Terminal 2 who were on their way to Langkawi for the Iron Man race. They too brought their bikes but theirs are not folding like mine. The wife is joining me in Bangkok on Friday but for now, it's just me and a Last Call announcement. Catch up with you all from Bangkok. Don't let your WMD vessel hit another country's WMD vessel by accident, like those Brits and French folk. Learn from mrbrownshow.com! "I took my IPPT...and got gold...I was hit with a SAF 100 last week telling me to attend weekly training sessions for a running competition." You think Singapore Armed Forces let you win $400 physical fitness award for free one ah? Fail IPPT tio, Gold IPPT also tio. Trying out the 12seconds.tv service. Yes, 12 whole seconds of video. 12seconds.tv is the twitter of video and I found it interesting and challenging to work within that 12-second parameter. My channel is at 12seconds.tv/channel/mrbrown and it is also linked to my Qik videos. So you see the first 12 seconds of any live Qik video I stream. Mrs Lim Hwee Hua, SMS (Senior Minister of State, and yes, they used this acronym there) for Finance, read her reply from her file, and gave a fluent answer (re-hashing) of the Government’s stand on why we should not disclose the amount of reserves we have, and that the SWFs did not do as badly as the various indices tracking the similiar markets. She also added that Temasek Holding’s portfolio fell 31%. When it was time for clarification questions, Ms Sylvia Lim rose to ask about the exact figure for losses incurred by GIC, since no specific number was quoted, while the 31% was disclosed for Temasek. Mrs Lim Hwee Hua was stumped for words for a few seconds, stammered a little, mumbled something about “it was reported during the budget debate last week”, while frantically flipping her file in front of her to look for an answer. Sylvia Lim spread her hands in a gesture asking “what number”, and Lim Hwee Hua, after not being able to give a specific number, suddenly succumbed and threw out a number, “41%”. The Speaker was nice to Lim Hwee Hua, seeing that she was not very sure of the number herself, and asked if she wants to clarify the number later. She took the opportunity, and since it was also time for the recess at 1520hrs, the Speaker declared that the Parliament go into recess. The wife was pleased to receive a few dresses from online store Famescape (famescape.livejournal.com). We were not obligated to blog about it but the missus liked their stuff and told me to mention them. I twittered it some time ago, and a friend ended up shopping there as well, so I guess their stuff is pretty good. 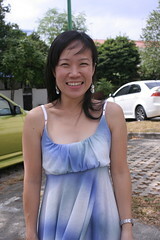 For me, I am just looking for any excuse to post my lovely wife's photo on my blog. 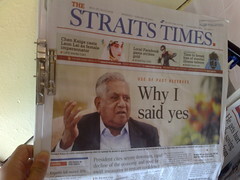 Swee hor, my wife? And across the land, Singaporeans collectively said, "Please lah." Here's a suggestion from the gahmen: there are cheaper nursing homes elsewhere, you know! Here on down to mrbrownshow.com! Rules: Once you've been tagged, you are supposed to write a note with 25 random things, facts, habits, or goals about you. At the end, choose 25 people to be tagged. You have to tag the person who tagged you. If I tagged you, it's because I want to know more about you. 1. I ride to work daily and rotate between four bicycles, a very fast hybrid, a modified mountain bike and two folding bikes. And their names are Alexia, Tank, Sasha and Natascha. Sasha and Natascha are named after two miniguns used by favourite character in my favourite computer game. 2. When I play computer games, I am not called mrbrown. I am named after a Battlestar Galactica character. 3. One of my email addresses is a very very bad word. 4. I was 91kg at my peak, in 2006. I lost 15kg in 3 months and have maintained it since with a sensible diet and daily riding. I never want to be that tub of lard ever again. 5. My wife and I are teenhood sweethearts. We've been together for almost 20 years. 6. When we named our firstborn Faith, we did not expect her to test ours. 7. Faith is autistic and is currently seven years old. She is the sweetest child in the world. Her first word was "Elmo". We await her other words with great expectations. 8. I wore glasses since I was 5 years old. This was before myopia became the norm in Singapore school kids. Without my glasses or contacts, I am almost blind. 9. I have traveled since I was 5 years old. My first country was Taiwan. We could travel every year only because my dad worked in Singapore Airlines as a ground engineer. He is very famous there, having worked there for more than 40 years. He never took a single day of Sick Leave. Except for the time he had to have a part of his lung removed, in the last year of his employment there. He is now retired. He is one tough guy. 10. All my kids have middle English names, including me. Their middle names are variants of my wife's and my English names. 11. My English first name and English middle name both have the same meaning but one is Greek and the other is Hebrew. I did not know it at the time I chose those names. 12. I served National Service as a mechanic and I was assigned to a Combat Engineer unit, fixing outboard motors (OBMs) for Boat Company. At the peak of my military career, I could rebuild a Suzuki 40HP OBM from just an engine block. The most enjoyable days of my NS were spent at sea, on 5-day round-island exercises as the resident mech. 2009 is my last year of reservist, as I hit 40. 13. I have an NTC-3 certificate from VITB, now called ITE. 14. One of my fingers has a hard fleshy area where I lost a chunk of flesh from a freak outboard motor accident in the army. The flywheel of the engine I was testing shredded the flesh of my finger when I instinctively tried to push down the OBM that threatened to fly out of the testing tank. No bones were broken but the grease-covered shredded skin looked damn cool. Yes, it was extremely painful. 15. I started playing trading card games in my thirties. I was playing against, trading and buying Lord of the Rings cards with Primary Two kids. My merry lot of boardgame and card game geek friends even traveled to Malaysia to play in regional competitions. Twice. 16. I cannot walk into a hardware store and not buy something. My wife has the same problem with stationery shops. 17. I actually hate pork liver. Tur Kwa makes me gag. 18. I am incapable of eating Quaker oats without throwing up. The texture irritates my throat. I am fond of unsweetened cornflakes and granola though. 19. I cannot eat an egg sunny side up, or any egg done with the yolk intact. The texture also makes me hurl. I am fine with an omelette and scrambled eggs though. 20. I used to part-time DJ in a radio station that broadcast from an Indonesian island. I still have some DAT tapes of my two-hour programs from those days. 21. I was an LDDS nerd. in the Literary Debating and Drama Society for six years, from Secondary 1 to Junior College. I did all of it — won poetry prizes, debated on tv, and acted in plays. My last stage performance was in George Bernard Shaw's play, "Arms and the Man" as Bluntschli, the Swiss voluntary soldier. I was 18. 22. I took public transport to school when I was Primary 5, and my brother who is 3 years my junior, did it when he was Primary 2, because my mother felt it was silly to pay so much for a private school bus. 23. I am currently using two phones N95 and N96, an iPod Touch and a Nokia N810 internet tablet on a daily basis. Yes, I am a gadget freak. 24. I collect Star Wars Clone Troopers. 25. I was fan of Chin Han and Lin Hsing-hsia Taiwanese romance movies which I watched at 3pm every day, at my aunt's house, after coming home from primary school. Get duh news hot and fresh at mrbrownshow.com! Alex Au on the internet response to Rear-Admiral Lui Tuck Yew, the junior minister at the Ministry for Information, Communication and the Arts, "stuffing his foot into his mouth", and the press coverage of it (see also my un-self-regulated response). Mediacorp's 'Today' newspaper, which had carried a straightforward report on Lui's statement in its Thursday morning edition, decided to do a follow-up story. At about 3 pm Thursday, the reporter called me. She introduced herself -– I don't think I had spoken to her before -- and launched into a series of questions. The thrust of those questions gave me the impression that the story angle would be exactly what the blogosphere was going on about: whether we agreed or disagreed with Lui's opinion. In fact, that was her first question to me, to which my response was that Lui was being unrealistic to expect "community regulation" to produce the result he wanted to see. The internet does not work like that, I said. The other impression I had was of a reporter trying very hard to get me to say something in support of Lui. (As the conversation went on, I wondered whether the brief her editor gave her was to go ferret out netizens who would lend support to Lui's point. Prove him right.) She kept asking essentially the same question -– didn't I think that community regulation was necessary in this case? -– repeatedly, but with different phrasing.